INTROL Thrombosis Genotype Panel is intended for in vitro use as a quality control to monitor analytical performance of the extraction, amplification and detection steps of test systems used in the qualitative measurement of the Factor II (Prothrombin), Factor V Leiden and Methylenetetrahydrofolate reductase (MTHFR) genes for mutations Factor II G20210A, Factor V G1691A Leiden, MTHFR C677T and A1298C. This product is intended to be extracted and analyzed routinely with each Factor II, Factor V and MTHFR test run. INTROL Thrombosis Genotype Panel is designed to monitor the detection of mutations Factor II G20210A, Factor V G1691A Leiden, the most common genetic risk factors for thrombotic events and MTHFR C677T and A1298C which are associated with thrombosis, cancers, leukemia, neural tube defects, high homocystine levels, cardiovascular disease, schizophrenia, Alzheimer’s and toxicity of anti-folate drugs like methotrexate. 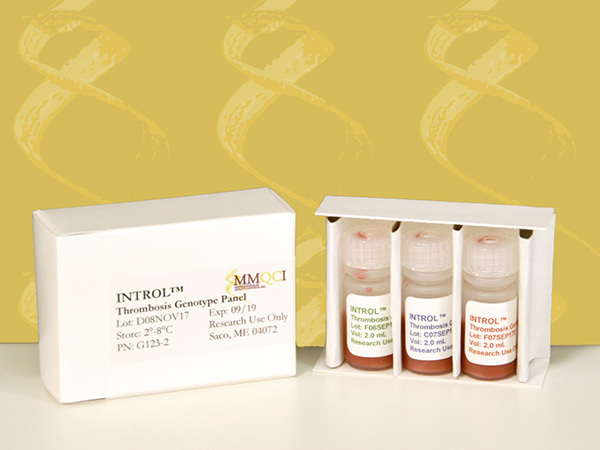 INTROL Thrombosis Genotype Panel is provided for Research Use Only (RUO).